I love Eastbourne. I’m sorry for bleeting on about it but if you ever get the chance to visit this tournament, do it! While it obviously doesn’t quite have the grandeur of a Slam, it’s an absolute must for a crazy tennis fan. You get to see so much! 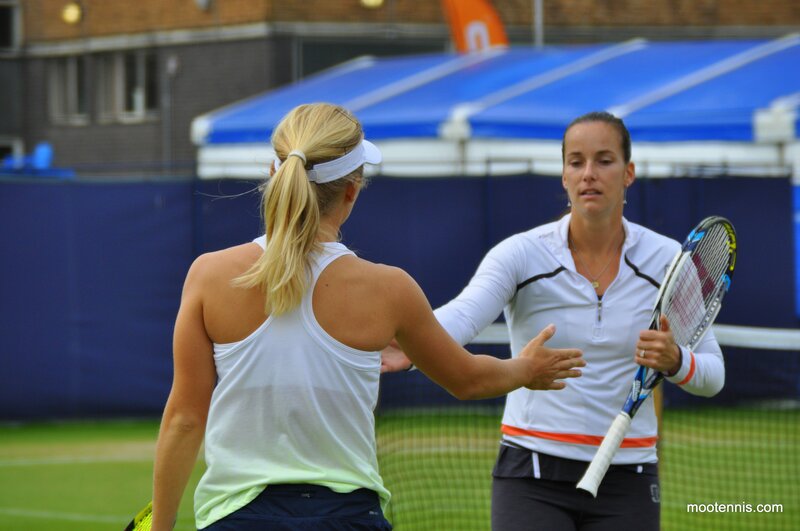 Here’s another post about what happened on the practice courts on day 2 of the 2015 Aegon International. I turned up at 10am as the gates open as I am an official tennis geek. I headed straight for the practice courts where the first player I saw was Caroline Garcia. Alexandra Dulgheru and Marina Erakovic were also just finishing up. Before their qualifying matches got underway at 11am, Daria Gavrilova and Jarmila Gajdosova were practising together. 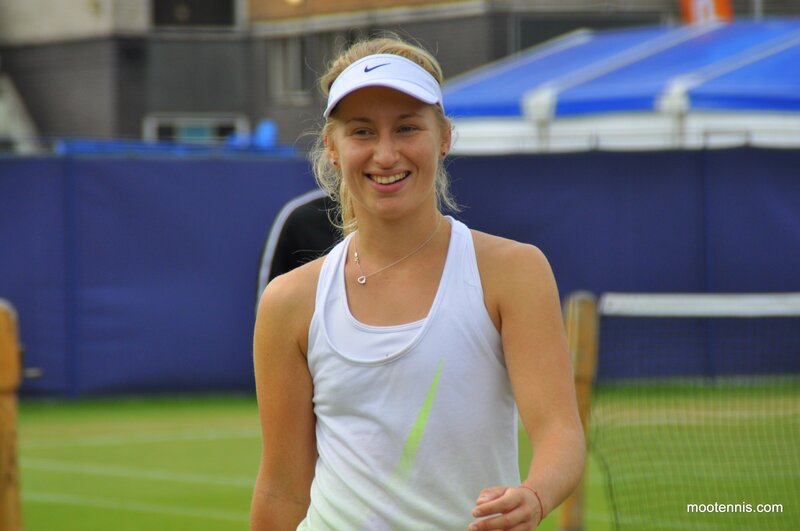 Gavrilova was accompanied by her coach, Nicole Pratt who is awesome. I think she is great for Daria. Gajdosova soon went off and then Gavrilova stayed with Pratt for a bit longer to practice dealing with slices., which was necessary going up against Erakovic. 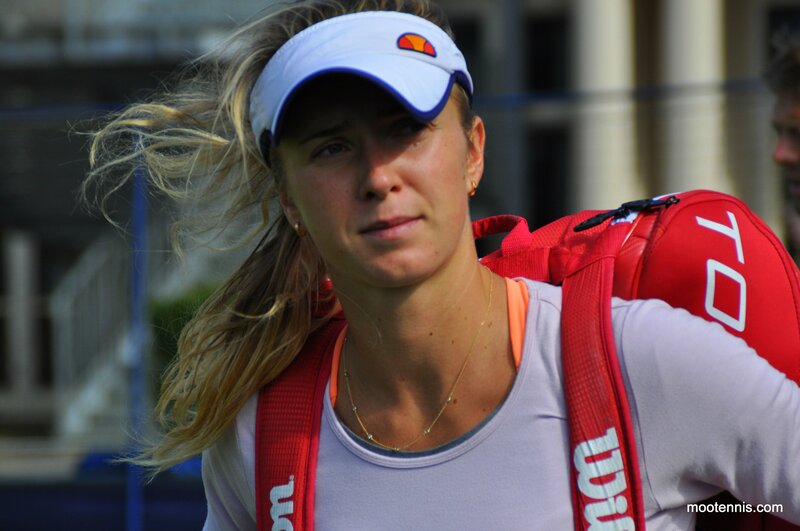 Pratt told Gavrilova she wanted her to commit to her shots. She also said, “remember Miami”… ? I then moved over to another practice court where Aleksandra Krunic was playing with Roberta Vinci. It was the first time i’d ever seen Krunic so it was nice to get a few shots. I didn’t think either player was looking great on the grass and they both ended up losing their first round matches in straight sets. I later saw Krunic hit a smash into the ground that bounced several times before it hit the net down set point in her match against Polona Hercog. 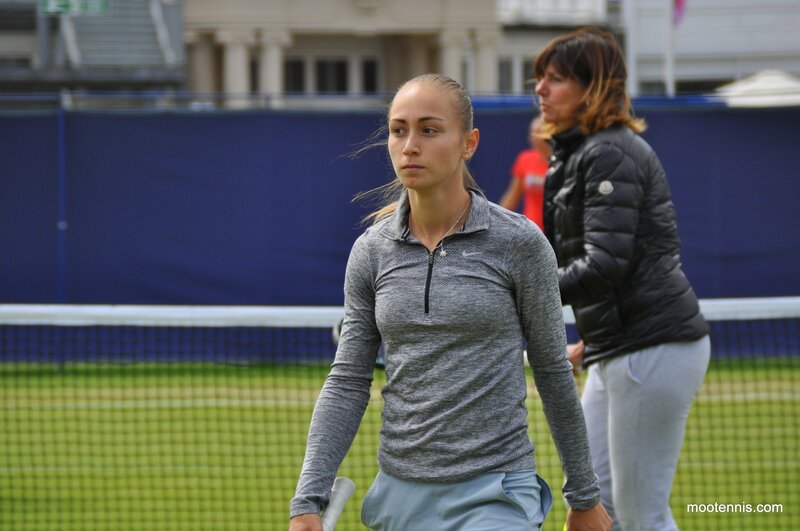 I didn’t realise that Krunic was working with Biljana Veselinovic. Last I knew was that Veselinovic was working with Cornet? I do enjoy watching Vinci and actually, her game is rather well suited to grass with her backhand slice. I finally spotted Lucie for the first time! She was warming up with Svetlana Kuznetsova. Her coach, Rob Steckley was also about and as he entered the court, he attempted to trip up Lucie who was running past… he’s a joker! The vantage point at one end of the practice courts that I spoke about yesterday had now disappeared as they have extended the fencing surrounding the players practice area. You could still get shots without the netting for this end court. Note, most of my practice pics are through black netting! Lucie and Rob warmed up for a bit and then headed off. 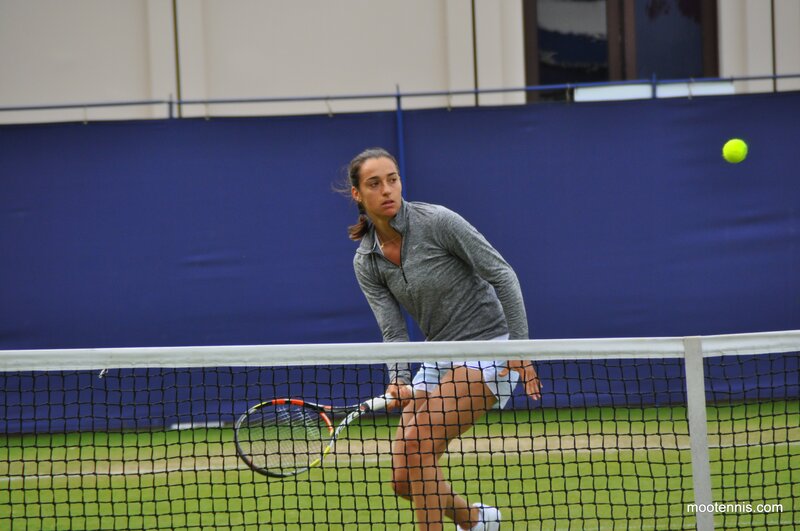 Andrea Petkovic and Madison Keys were practising together on the three practice courts just around the corner. These are a little hidden but still accessible to the fans from one side. Both times that I have seen Keys this week (admittedly brief), she hasn’t looked that comfortable. Lindsay was there again with her husband and her kids watching on as well! They were playing a practice match but I have no idea who was winning. It was my first sighting of Petko who looked pretty serious and was training later on in the afternoon on this court. Camila Giorgi was practising later in the afternoon. Her father, Sergio kept turning up to watch matches on Centre Court. A bit later in the afternoon I saw Lucie again warming up in the practice area. 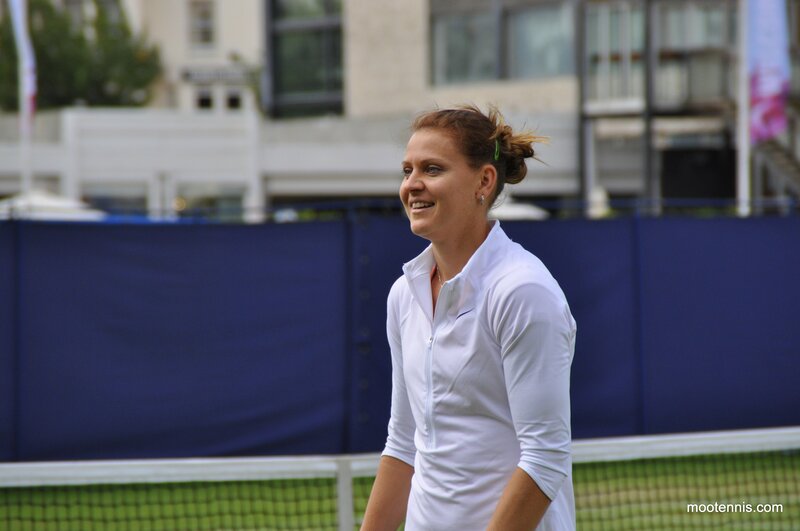 She was laughing and joking around with Barbora Strycova. Babs had an eventful day! Rob came over and gave Babs a big hug. 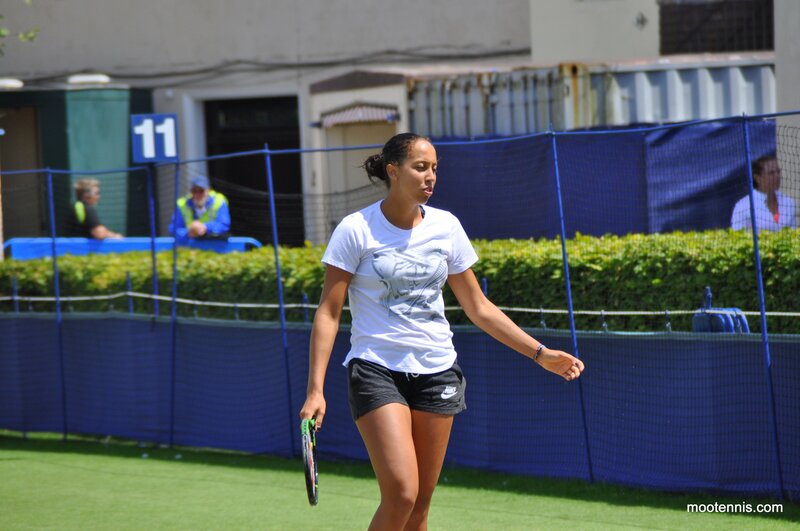 They then wandered off again and this time I twigged that they were going round to the other set of practice courts. Lucie was practising with Elina Svitolina. Lucie seemed to be playing well. At the end of their practice, I got a photo with Lucie which i’m still chuffed about. It’s the first (and probably last!) photo i’ll get with a player. It really made my day and i’m so grateful for @Pearlescent48 on Twitter who took the photo! You may ask why i’m not sharing the photo but i’m not yet ready to reveal my face 😛 Lucie was really sweet and I asked her whether she liked the fanbook and she said yes! I’ll try and do the same tomorrow although there may be less opportunities with rain on the forecast! James those photo’s were just Awesome! 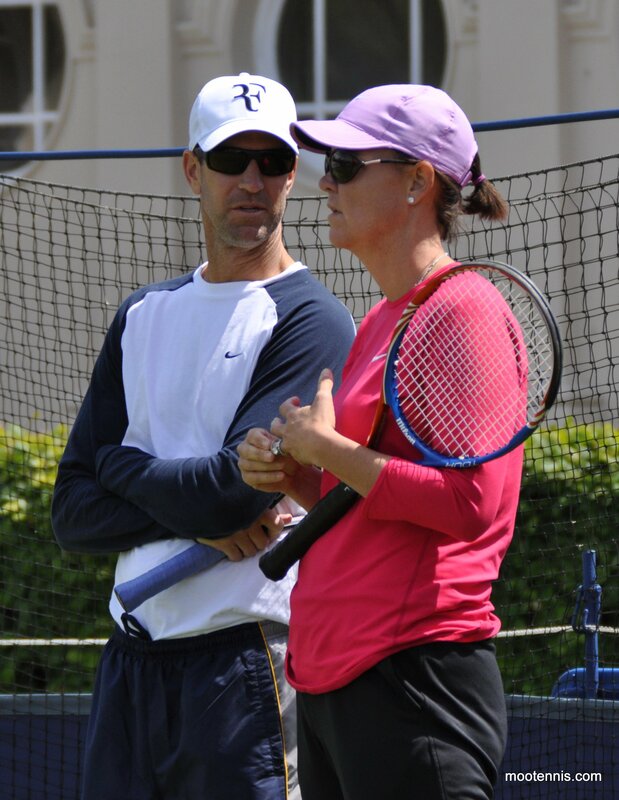 agree Nicole Pratt is a good coach for Daria,even though I am totally against ‘on court coaching’ Nicole Pratt to me has great words of wisdom for Daria. I’m going to put some quick thoughts about today’s matches but it’s raining so there won’t be much play I suspect. I’ll be back to regular previews for end of Eastbourne and Wimby! Anyone on James Ward vs Tim Smyczek match today? I am playing Blind on the local boy.Odds have already drifted from 1.85 to 1.65. Loving the photo’s. When I’m not too busy working and studying, I’m going to have to visit Eastbourne- hopefully next year! I love how Svetlana Kuznetsova is friends with EVERYONE on tour. Even back when the Williams sisters were considered cold on tour towards other players, she seemed to be one that they’d let inside their clique and laugh and joke with.